"One of the funniest, most touching and bizarre nonfiction books I've read." 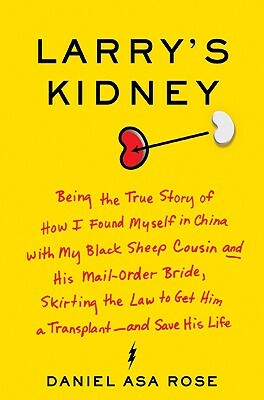 --Boston Globe Larry's Kidney is Daniel Asa Rose's wild-and-crazy memoir about his trip to Beijing, China, to help his black-sheep cousin Larry receive an illegal kidney transplant, collect a mail-order bride, and stop a hit-man from killing their uncle. An O. Henry Prize winner, a two-time recipient of PEN Fiction Awards, and a 2006 National Endowment for the Arts Literary Fellow, Rose has written "a surprisingly fun, and moving, book with resonance" (Chicago Tribune).